Barrett All: What's In My Drawer? "Hey Patty!" the kids ask, "What's in your top drawer?" 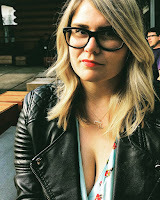 Well kids, as I've never been one to hold back about my most secret posessions. I will share with you what is in my top drawer! Bobby pins. Why bobby? I don't know. Why can't they be called Kevin pins? Multi-colored sharpies. I bought a pack of 26 one time. I have NO idea why. A blue stapler I stole from my parents. An index card with a line-up for a Slow Clap show written on it. Apparently we did Quick Scene Opener, Ding (Say it Again), 4-Pack, Serious Scene, Replay and Montage. Fun! What's that lady with red hair? It's not me. 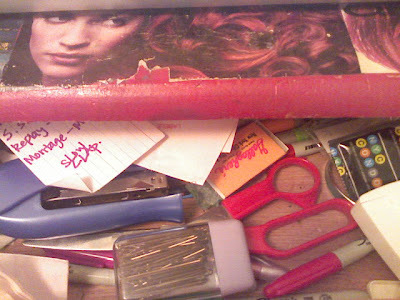 My entire wooden desk was painted red and modpodged over with magazine ads and clippings. That particular lady was found in a Pantene Pro-V ad for Red Expressions shampoo. I liked her red curly hair. That was a pointless post. Part of my charm. That and getting drunk to solve all problems. And constantly speaking in annoying bits. And gossiping. bobby pins are named like that because they were originally invented to keep shorter hair styles (like bobs) under control.